....and a sea captain acted as steersman of each boat, of whom I recollect Capt. Abraham Whipple, Capt. John B. Hopkins (with whom I embarked), and Capt. Samuel Dunn. A line from right to left was soon formed, with Capt. Whipple on the right and Capt. Hopkins on the right of the left wing. Since Hopkins was in command of the boat in which Ephraim Bowen was riding, he was also in command of the actions of fellow rider Joseph Bucklin. Bucklin would have to have had at least the tacit approval of his boat commander for him to fire his rifle at Lieutenant Dudingston. Left. Portrait of John B. Hopkins c1776. Artist unknown, but subject name written on back of painting sold on eBay 2004. The provenance may be in question as writer Andrew M, in 2018 notes that the clothing worn in the portrait is more typical of that worn in 1830-1840, perhaps by another man named John B. Hopkins. We also note with interest in Tillinghast, Wayne G. "The Three Captains Joseph Tillinghast of Providence". Rhode Island Roots 30:57-86, June 2004, p67 that John B. Hopkins joined in sponsoring a privateering ship along with known Gaspee raider Joseph Tillinghast and others of like ilk. Esek, soon after the death of his father in the summer of 1738, a stout, tall and handsome young man, then in the twentieth year of his age, bid adieu to the old homestead and journeyed to Providence and became a sailor, soon rising to the position of Captain. He married when he was twenty-five years of age, Miss Desire Burroughs, daughter of Mr. Ezekiel Burroughs, of Newport, and took up his residence there. His conspicuous services in the war of the revolution, as the first commodore of the navy are well known. His fleet, consisting of the ships Alfred, Capt. Dudley Saltonstall, and the Columbus, Capt. Whipple, the brig Andrew Doria, Capt. Nicholas Biddle, and the Cabot, Capt. John B. Hopkins, son of Esek, and the sloops Providence, Fly, Hornet and Wasp, put out to sea Feb. 17, 1776, with a smart north-east wind, and cruising among the Bahaman Islands, captured the forts at New Providence, Nassau. This was a very fortunate affair, for the heavy ordinance and stores taken proved quite acceptable to the country. He captured two British armed vessels on his return. On the 22nd day of the month, by a resolution of Congress, Dudley Saltonstall was appointed captain of the Alfred frigate, Abraham Whipple of the Columbus, Nicholas Biddle of the Andrea Doria, and John B. Hopkins of the Cabot. Haysted Hacker, lieutenant of the Providence, was promoted to her command. The celebrated John Paul Jones was first lieutenant of the Alfred, and Jonathan Pitcher, of the Columbus: Esek Hopkins, an old man, commander-in-chief, as they chose to style the leader of their squadron. During the winter, the young flotilla, while fitting for a cruise, was frozen up in the Delaware river. Com. Hopkins, however, got to sea on the 17th of February, 1776, with seven armed vessels under his command, the largest of which was the Alfred of twenty-four guns instead of thirty-six, and bore away southerly, in quest of a small squadron under Lord Dunmore; but not falling in with him, concluded to make a descent on the island of New Providence, for the purpose of capturing military stores. This service was performed under the conduct of Capt. Nichols, the senior officer of the marines, at the head of three hundred men, whose landing from the boats of the squadron was covered in gallant style, by Capt. Hacker, of the Providence, and the sloop Wasp. The attack was entirely successful, and possession was taken of the fortifications and the town. The main object of the attempt, a magazine of gunpowder, was in part secreted by the governor; but they brought away four hundred and fifty tons of cannon and other military stores, with the governor and some others as prisoners. Having accomplished this victory, they sailed on the 17th of March, for the United States. At one o'clock in the morning of the 6th of April, the squadron fell in with the Glasgow, British man-of-war of twenty guns, off the easterly end of Long Island. The little Cabot of fourteen guns, Capt. Hopkins, being the nearest to the enemy, ranged manfully along side, discharging her broadsides with great spirit, but was soon obliged to haul off from the superior fire of the Glasgow. The Alfred now came up to the rescue, but after a short running fight, had her wheel ropes cut away, and became unmanageable. The Providence, by this time, had passed under her stern, and fired a number of broadsides with great effect. Capt. Whipple in the Columbus, could not get into action for want of wind, which was light and baffling, sufficiently near to afford much aid, or the Glasgow would have been captured. The darkness of night still continued, when seeing the approach of another antagonist, she spread all sail in flight, with the Columbus is pursuit, bat was soon signaled by the commodore to give up the chase; as they were approaching so near the harbor of Newport, where lay a large fleet, that the report of the cannonade would call them out to the rescue, and thus perhaps the whole American force might fall into their hands; as they were so deeply laden with the captured military stores, as to make all dull sailors. On his way back, Capt. Whipple fell in with, and made prize of the bomb ship of the British fleet, which had long been a terror to the people of Newport. The fleet arrived safely into the harbor of New London; but were soon after removed to Providence by the commodore, the British having left the bay of Narragansett. Per the 1770 List of Providence Taxpayers, John B. Hopkins did not own property in Providence at the time. This makes sense, as we know he lived in Newport, not Providence. We do find his father, Esek Hopkins with two properties, and his uncle Stephen Hopkins, as well as a Christopher Hopkins and a Rufus Hopkins. This Rufus was probably the Rufus Hopkins (c1726-1809) that was the son of Stephen Hopkins, but we have no idea who Christopher Hopkins was. F Sarah HOPKINS died 5 Dec 1757 in Providence, Rhode Island. Notes: Obituary, Providence Gazette, December 10, 1796, "eminent nautical commander"
John B. Hopkins' wife, Sarah (nee Harris) was his first cousin, since she was the daughter of his aunt, Hope (Hopkins) Harris. This was a common practice at the time. According to the RI Historical Cemeteries Database Sarah Harris is buried in the Old North Burial Ground in Providence, whereas the only Captain John B. Hopkins buried in RI records is at the PV023 ADMIRAL ESEK HOPKINS BURIAL GN, PROVIDENCE which was [REMOVED TO NORTH BURIAL GROUND] later. The RI Historical Cemeteries Database lists this individual as having the same death date as our John B. Hopkins, but a birth year of 1762, not 1742. No children have been listed from the union of John B. Hopkins and his wife Sarah Harris Hopkins. Fellow Gaspee raider Benjamin Page continued his association with a Captain Hopkins later in the Revolutionary War. Beside Captain Whipple, Page also sailed under Capt. Samuel Nicholson, Capt. John B. Hopkins, Jr., Capt. Dudley Saltonstall, Capt. Joseph Olney, Capt. John Manley and Capt. Hoystead Hacker. But this could be either our John B. Hopkins or (doubtfully) his son. History can warp the term of Captain John B. Hopkins, Jr. Since our John B. was the son of the Commander-in-Chief of the Continental Navy, Esek Hopkins, he would likely be called "Junior" Hopkins by his comrades. Note here too, that the people that Benjamin Page sailed with are being referred to in the context of the high rank of Naval Captains, not simply the generic captains of ships. If there ever was a John B. Hopkins, Jr. born in 1762, he would've been only 21 years old by the time of the end of the Revolutionary War. By then, the importance of his grandfather, Esek, would have been tainted by his previous dismissal from command. It is therefore unlikely that nepotism would have advanced such a young John B. Hopkins, Jr. to the rank of Captain. Note too, that of all the eight Captains listed as having sailed with Benjamin Page, only Captains Nicholson and Manley weren't in the initial naval officer appointment list for the Continental Navy and sailing together with our John B. Hopkins in Narragansett Bay in 1776. In the 26May1777 edition of the Boston Gazette we find an ad offering a reward of $20 plus expenses for the capture and return of each of sixteen crewmen that had deserted at Providence from the Continental frigate Warren, John B. Hopkins, Commander. We note an ad in the Providence Gazette of 23Aug1783 of John B. Hopkins having for sale a few hogsheads of rum. The Connecticut Gazette of 14Apr1786 tells us that John Hopkins left in a ship from Rhode Island on 28Dec1785, lost all of his stock, but arrived safely in Surinam. According to the Whipple Genealogical Database at http://whipple.org, Esek Hopkins of 1718 had 9 children, of which his eldest was John Hopkins born 25 AUG 1742 in Newport, RI. Since his mother's maiden name was Desire Burroughs, it is likely that his middle initial would be "B". Esek of 1718 did have an older brother, John Hopkins, born in 1713, but his mother was a Wilkinson, and Governor Stephen Hopkins also had a son, John Hopkins of 1728 but who died on the Iberian Peninsula in 1753, long before the Gaspee affair. Robinson refers to the Gaspee raider John Hopkins as the nephew of Stephen Hopkins, which only the John Hopkins of 1742 would be. 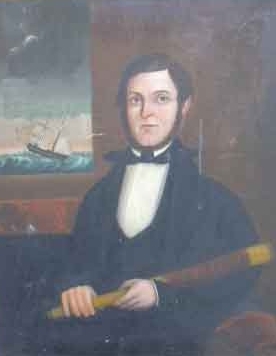 Our Captain John Hopkins would have probably used the name of Captain John B. Hopkins to distinguish himself from both his uncle and cousin within a very prominent Rhode Island family. We conclude that there is a typo on the RI Historical Cemeteries Database that falsely gives his birth date as 1762. Our conclusion is that our Gaspee raider is Captain John Burroughs Hopkins (1742-1796), and that he is buried with his wife in the Old North Burial Ground as were many other fellow Gaspee raiders. The Gaspee Days Committee therefore recognizes him as a true American patriot.